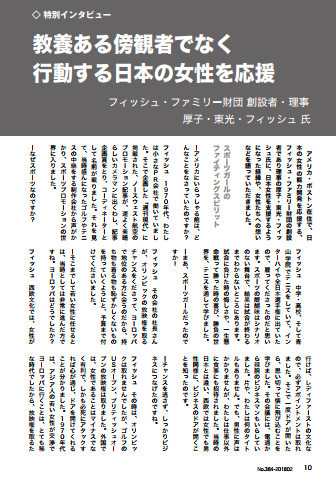 Atsuko Fish is featured in Philanthropy Magazine in Japan! This article highlights Atsuko’s work from how she got her start in a PR firm in Japan to how she met her husband, Larry Fish. She also speaks about her inspiration behind JWLI and her long-terms goals for the program in order to empower women in Japan. She also speaks about her hopes for the Champions of Change Award, which is based on the Champion of Change Award she received from President Barack Obama in 2013. Check out the article here! In December, Program Manager of JWLI Kozue Sawame presented to Japanese students from the Showa Boston Institute on Women’s Leadership. 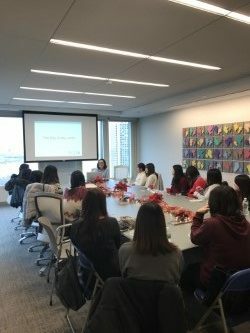 Students from the Showa Boston Institute came to Fish Family Foundation to hear about Kozue’s experience and Women’s Leadership in the United States. The class highlighted Women’s Leadership in the global sphere and part of the curriculum focused on the UN. The instructor of the course wanted to bring the students to Fish Family Foundation in order to see an example of a foundation that was started and run by Japanese female leaders, who are now living and working in the United States. Kozue spoke about her personal experience along with the overall arching goals of JWLI and the importance of empowering Japanese women in the Boston area. The Showa Women’s University in Tokyo opened up a satellite campus for English Majors in Jamaica Plain, Massachusetts in 1988 and since then has worked to promote awareness, intercultural and cross-cultural dialogue and global experiences for Japanese students and the greater Boston community. Over 700 Japanese students study in Boston every year from Showa University.